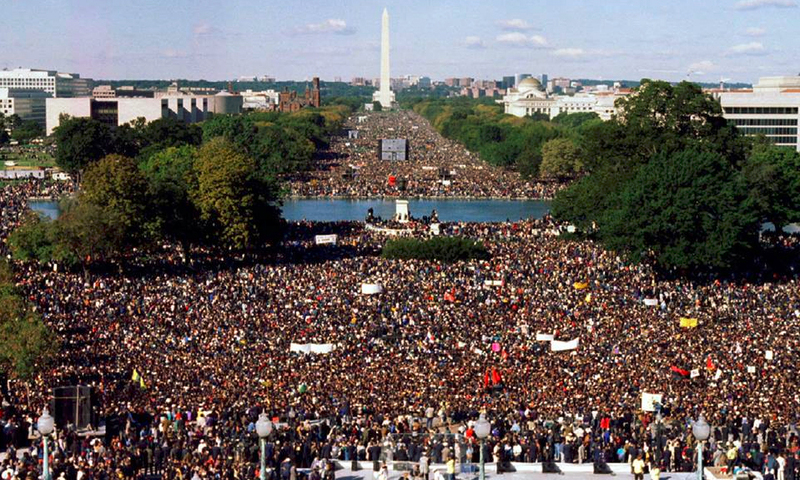 Do you know about the Million Man March? Not the one that happened in 1995, but the one that happened this year in Washington DC on 10/10/15? If you read about it on the internet you probably already knew about it and were looking for it. To say it was a not insignificant event is a vast understatement. To say it was under-represented really doesn’t convey quite how bad the media’s failure to report on an important story was. Media blackout is one of those controversial terms that get people looking at you like you’ve been hitting the hard stuff and dosing up on paranoid conspiracy theories, but what else do you call it when mainstream media outlets sidestep such a major event? Why is it important? Because even if there weren’t a million people there, even if it was only hundreds of thousands of people – those people had something to say, and it was something that should have been listened to. Given what has happened in Ferguson, with Trayvon Martin, and a number of high profile cases involving racial violence, to further the problem by ignoring a demand for “justice or else” seems ill-advised, designed to throw oil on the fire; is going to do nothing other than make people who already feel somewhat disenfranchised by the lackluster response of those in power feel even more cynical and angry about their treatment. It was reported that President Barack Obama was present at the last Million Man March, and it seems an oversight that he failed to appear at this one. Of course there are matters of foreign policy and state that need attending to, but lending an ear to the concern of a whole sector of the country – to the demands of people who feel they have not been served by their elected representatives or by law enforcement – wouldn’t that be worth allotting some time in your schedule for? What few articles were available focused on supposed negative aspects of the event, being primarily focused on problems the writers had with the viewpoints of Minister Farrakhan, and where he couldn’t be attacked, the numbers were lessened. The pictures in various feeds made it look as if the event swelled the place with as many people as attended President Obama’s Inauguration, but you would think it was a couple of guys milling around as the tumbleweeds blew through if you took what small amount of column inches the event garnered. The site https://www.justiceorelse.com says: “We want justice! We want equal justice under the law. We want justice applied equally regardless to creed or class or color.” There has been discussion of the meaning of “or else” but the positive has been largely ignored – not much talk of the call to raise up the black community and talk of better treatment for the members of that community, because it is not as likely to sell newspapers, because where are the sensationalist headlines in that? The media perhaps thinks that it has no need to PR itself, that it does not need to market itself, that people do not question its reputation, or the veracity of what it reports. They would be wrong – and any newspaper or televison company that looks at the lay of the land now and thinks they are safe if they keeping breaking the covenant the media has with the people, they aren’t going to survive, and maybe they shouldn’t. It is easier to check the veracity of a story, people have networks of friends distributed throughout the world thanks to social media – they are hooked into the local on the ground citizen journalists, and general population, who see what transpires and report it as it happens. Fruitvale Station made the rounds on social media before a lot of the mainstream outlets picked it up, and a lot of people don’t use those outlets as their primary source for news anyway. To remain relevant, and to remain honest, or in a lot of cases to regain those two qualities, standards of reporting need to be improved – events need to be reported on. Events like the Million Man March cannot afford to be ignored.